Now the clock’s have gone back and nights are drawing in, cycling to work may be carried out at dawn, dusk or in the dark. Cycling in the dark (or dusk) presents a risk of not being seen by other road users. The result could be an accident or near miss and cause distress / upset to other road users. As road users, cyclists must take responsibility for making sure they can be seen. Some responsibilities are required by law e.g. lights and reflectors and some could be regarded as ‘in common use’ e.g. hi viz clothing. The use of fluorescent or light coloured clothing is refrerred to in Highway Code rule 59 which means that they can be used in court as evidence. This rule could be used to aportion blame onto the cyclists in the case of an accident, whatever the circumstances, or to reduce compensation from an insurance company. Have a white front and red rear light lit. Flashing lights are permitted. Have a red rear reflector. Have amber relectors on your pedals, front and back i.e. four 0ff. Ensure that all lights and reflectors fitted to your cycle are clean and working. A white or yellow reflectors on both sides of the front and rear wheels. The wheel and front reflectors can be removed, but if they are fitted they must be clean. Flashing LED lights are permitted and can be used on their own without the need for any other lights. This type of light is cheap, batteries last for ages (but not for ever so don’t forget to check) and are very effective for being seen. In an article, a former RAF test pilot advocates using flashing LED lights during the day to improve visiblity read the article here. Front flashing LED lights are no good for seeing where you are cycling so you may need an additional front light with a constant beam. There are many types at a whole range of prices. Constant beam LED front lights are gradually taking over the front light market and prices are dropping. They have the advantage of never having to change a bulb and have a bright beam for a small size. WARNING DON’T DAZZLE! – It is illegal to dazzle other road users so be cautious if using powerful LED lights, which are now common. If your light is on the handlebars make sure they can be dipped towards the road to prevent dazzling, which may be a different position you required for off – road use. Be careful if using helmet lights as these can be shine directly into the eyes of oncoming drivers. There are many lights avalable now for cycles e.g. spoke lights, which can improve visibility further. Another note of caution, too many lights could be classed as distracting to other road users, so keep lighting to a safety function and resist the urge to ‘pimp my ride’. Don’t forget to put lights on early enough. If other vehicles have their lights on then that is the time to light up, even if it still looks light. Wearing hi viz or light coloured clothing is a good idea when cycling at any time. At dusk and in the dark it is hard to justify not wearing it. Hi viz clothing ranges from a basic vest for about £1 to a few hundred pounds for a full Gortex jacket, with a lot of choice in-between. Hi viz covers for rucksacks, helmets and over trousers are also available. Can you be seen ‘side on’? If you have wheel reflectors and are wearing hi viz clothing there is a good chance that you are, but do a check. LED spoke lights and reflective tubes that fit around spokes are available and improve visibility. OK so you have got your lights and a hi viz vest but can other road users see your hand signals? If you have a dark jacket underneath your hi viz vest and dark gloves, your hand signals may not be seen. If you have a hi viz jacket your arm movements can be seen otherwise hi viz gloves are available and some LED light bands for hands. 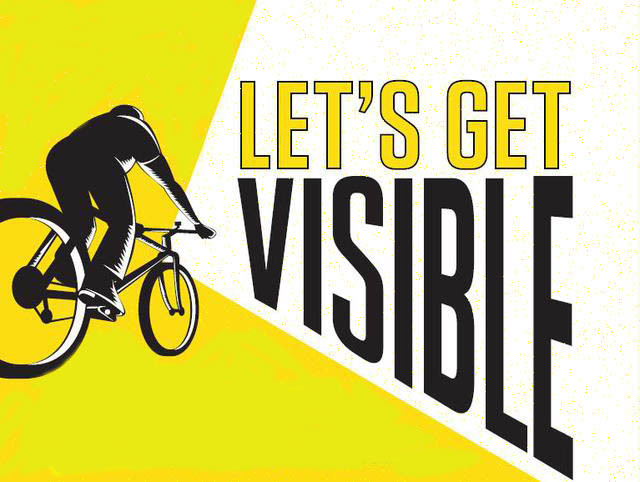 Please help HarBUG to spread the ‘Let’s Get Visible’ message by downloading our poster and displaying it around your organisations notice boards and cycle parking.